Hi, recently I deleted my Facebook account. I have a new one but since I can't access my Animal Cove account, I can't relink it. If that's even possible. I was on level 415+. The reason to why I'm writing this here is because the email failed to get sent. "animalcovehelp@kingisle.com" - I found that email in one of the replies to a Google Play review. That seems true. I sent an email to that address! Thanks! My Google Play account is Mary 1337 and my Facebook WAS [name name]. I have made a new Facebook account so I need to relink my Animal Cove account! I can't log into my Animal Cove account. I was on level 415+ and I have played for MONTHS. Typically, if you aren't connecting to Facebook or the store, it's because you're not connected to wi-fi (or internet). This can occur even if you're showing as connected. Easiest thing, just toggle the wifi on/off a time or two and see if that helps reset the connection. Check your mobile device's browser too to confirm your internet connection. THATS NOT EVEN WHAT I ASKED, Where did it say that I couldn't reach my acoount because of connection? Thanks for starting my morning by me getting mad. Seriously. How rude can someone be at reading that you go for an answer that is "almost" alike. Last edited by mary1337; January 6th, 2019, 05:37 AM. Our apologies about misinterpreting your message mary1337. Please reply to the same ticket and express your correction that it's a new account that's the problem with linking. Can someone explain the underscored sentence? Okay, so I can't re-link it, if you are going to give me a solution (as you did with the underscored sentence!) do it FULLY. Hi mary1337! Thanks for following up with us here. 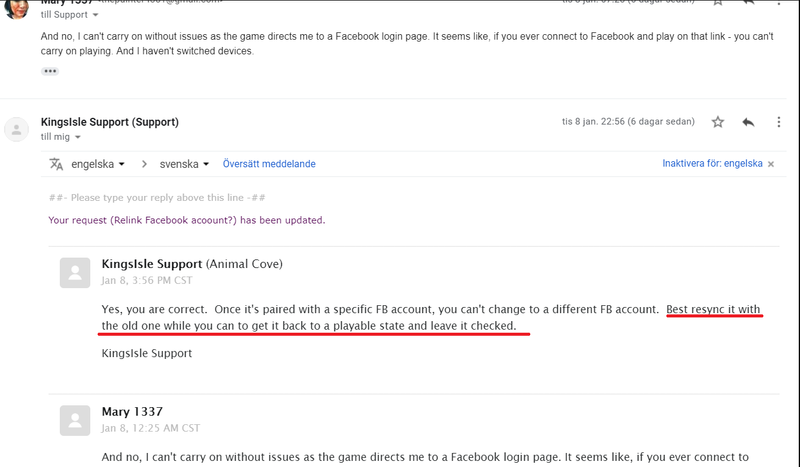 What they are suggesting is to log out and back in with Facebook and then reconnect to the game. Sometimes "turning off/on" the system does the trick . That doesn't make sense at all but I tried it anyways. Good job, I'm signed in with my Facebook account ... But yeah. It doesn't say which account!!! Great, lost all progress. How am I supposed to continue my gameplay, I want to remove the Facebook account linked with my game account! How hard can it be to understand that? Please email animalcovehelp@kingsisle.com and we'll happy to help here. If you could clarify the question to them, they misunderstood previously. Thanks Mary!